That winter birding lull that plagues listservs and online groups with arguments seems to have reached new levels this winter as people debate not only how close one should get to an owl, but if feeding them ok (cause someone started a website on how to feed snowy owls) to a direction I didn’t expect when a Wisconsin falconer live trapped a first winter snowy owl last week near Freedom. There’s been some confusing info because Project SNOWStorm also captured and put a transmitter on a first winter female Snowy Owl around the same time in the same area. 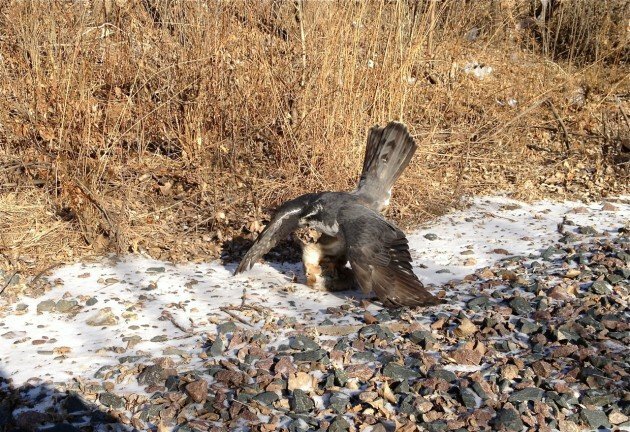 But a falconer did legally trap a snowy, I saw the picture on his Facebook page before he deleted it after a firestorm of controversy exploded. But then I thought of the other wild raptors falconers can take like a Northern Goshawk, Gyrfalcon, Great Horned Owl and Peregrine Falcon and debated with myself about why an owl is different. Why should a Snowy Owl get a pass with me but not a Great Horned Owl? It’s not like the guy took the only Snowy Owl reported in the state, he opted to trap one when there is a huge influx of Snowy Owls. Snowy Owls are used in falconry, more so in Europe but they are legal for a few states here in the US. They’re not known to be the easiest birds to work with, especially when the temperatures are high. When I looked at lists of birds allowed for falconry in Minnesota years ago, I asked some of my falconer friends, “Really, owls?” Most shrugged and said very few US falconers fly owls because they’re slow and some species you can only hunt at night, that wouldn’t be much fun to watch. I think what bothered me most was that I knew how angry birders get about owls and that this would be bad PR for falconry. I enjoy falconry, it’s not merely a sport or hobby, it is a lifestyle. I would love to have a Red-tailed Hawk but with my travel schedule, there’s no possible way I could work with a bird, so I content myself with going out with my friends when they are gracious enough to invite me along like in the above photo when one of my falconer friends let me join him when he was hunting with his goshawk. I haven’t always had such a high opinion of falconers. The few bird books I was given as a kid that described it made it sound horrible: birds are kept in closets in complete darkness, they are starved to bond them to their masters, they never know true freedom again. Then I started volunteering at The Raptor Center to give educational programs with live birds of prey and my trainer was a master falconer. Turns out the founder of TRC and many the vets who worked in clinic were falconers as well. I learned that I knew nothing of falconry. Falconry birds are essentially pets. No. If anything, falconry birds like the above red-tailed hawk are a hunting partner, especially wild caught birds. If you are a bad hunting partner and do not flush enough game, the raptor will fly off when released and not return. Falconers must always keep their birds somewhat wild so if they get separated or the bird flies off never to return, it can still survive on it’s own without human intervention. Falconers can trap any bird of prey any time they want. No. Many get their birds from breeders. Falconers who do trap wild birds are only allowed to trap birds in a certain time frame. The trapping period generally coincides with the fall raptor migration, but generally goes through January. Falconers are only allowed to trap first year birds. Adults that have been living in the wild are off limits, while inexperienced birds still learning the ropes are allowed. Considering that most birds hatched in spring do not live to see the following spring, the birds get a shot at a longer life if not different sort of life. Falconers keep their wild caught birds until they die. Not all of them do. All apprentice falconers are allowed only 1 of 2 species: American Kestrel or Red-tailed Hawk. They must trap a hatch year bird and after two years, they must release it back to the wild. Some falconers will also release birds that aren’t easy to work with. Many general and master falconers with wild birds will also let them go after a few hunting seasons, especially if they are good hunters to give them a shot at spreading their genes in the wild. When Merlins first started nesting in the Twin Cities metro area, one of the birds had a band. It was eventually read and turns out the bird was a released falconry bird. Falconers keep their birds in the dark. Not all the time. When you see a falconer transporting their bird or walking with a group, the bird might be in a dark crate or hooded. This simply keeps the bird calm in uncertain situations. The birds are not in the dark all the time and do not constantly wear a hood. It’s only worn in potentially stressful situations to the bird. Also, all falconers have to have their raptor holding facilities inspected by the state. If it doesn’t meet bird of prey housing standards, they can’t have a bird. Though these mews aren’t the size of football fields, they allow the bird to move around, take baths and feel secure in their environment. They also have to exercise their birds to keep them in top physical condition for the hunting season. Falconers starve their birds. No. Falconers weigh their birds constantly and during hunting season manage them on a little less food, but that’s so the birds will hunt when released. If your hawk or falcon (or owl) is well fed and not hungry, when it’s released for hunting, it will simply fly to a branch and watch the humans flush prey with little to no interest. All the training with the bird is based on positive reinforcement. If the bird was starving or if you are a bad hunting partner who doesn’t flush lots game, that raptor will fly away when you let it go and not come return to the you. If you see a known falconer trapping a bird of prey, he’s taking it for falconry. Not always. Quite a few falconers are also licensed bird banders. They know how to trap raptors and if something is interesting nearby, they will try to band it for research. Falconers cruise listservs and eBird to find birds to catch. Most falconers trap in the fall and will try to go to spots where there’s a raptor migratory route to have several chances to catch a first year bird. They’re not too keen to go out and trap a bird that is being watched by many people. Is there a black market for falconry birds? Sure, internationally and it’s generally poachers going to trap white Gyrfalcons in remote areas. But that’s a larger poaching issue. Not all falconers in the US are maniacally rubbing their hands wondering what birds they can remove from the wild forever. Of course I can’t speak for every falconer out there. Are there unethical ones? Hmmm, probably the same percentage that we have of jerk birders in our community. But falconers go to great lengths to police themselves because they love birds of prey, they love what they’re able to do and they don’t want someone doing something stupid to ruin their privilege of hunting with a bird of prey. 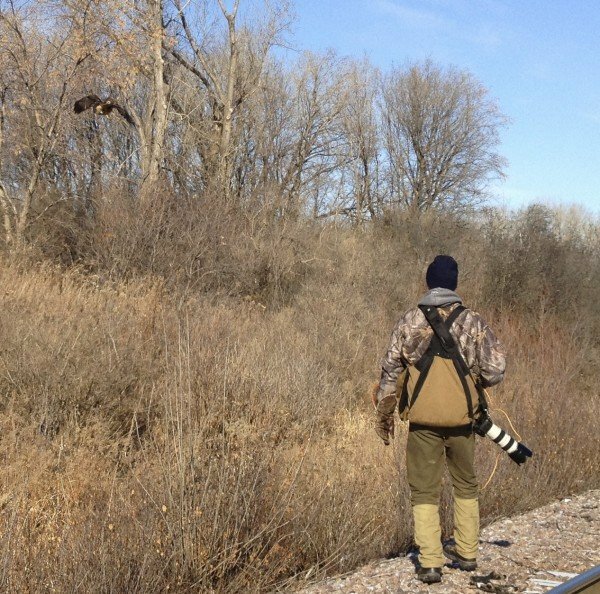 I think what separates them from birders is that we like to enjoy birds at a distance. Falconers want to be part of the process, they want to get as close as they can to the exciting hunting potential of a bird of prey. I would encourage you to find out who the local falconers are in your area. Ask if you can ever go hunting with them. It’s incredible to watch a Norther Goshawk or a group of Harris’s Hawks in action and up close. Find out for yourself with falconers what it’s all about, you might be surprised. 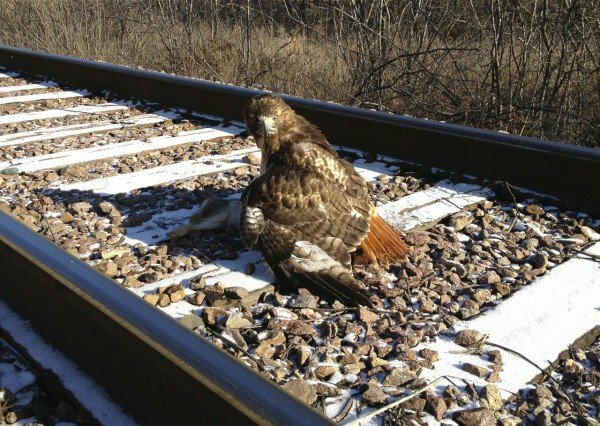 I talked to some of my falconry friends about the Wisconsin man with the snowy. They are going to watch the situation but one told me that this man has hunted with a wild snowy several years ago, so he’s had experience working with them. The previous snowy was a good hunter but unfortunately that owl caught a feral pigeon that had frounce and died not long afterwards–something that could happen with a wild snowy. Who knows, maybe after a couple of years hunting together, he will release the Snowy Owl back to the wild. In Pennsylvania, a falconer (or maybe more than one) have been using the Freedom of Information Act to get breeding site info on goshawks that were being studied by federal agencies. This basically shut down the federal agencies involvement which is frustrating since goshawks in the east are not doing so well. I am much less concerned about Snowy Owls being trapped out, I don’t really get the appeal, but I don’t think my lack of understanding nullifies the activity. 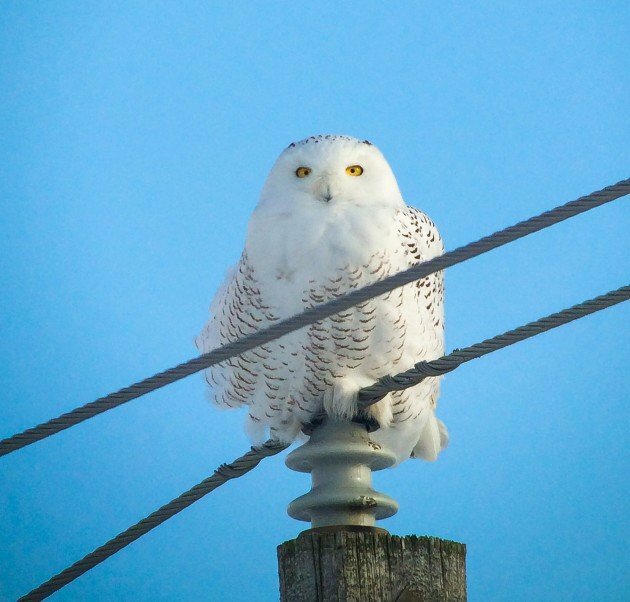 Snowy Owl populations are doing fine. I’m not sure where your information stems from, but I would question the validity of your source in the future. Our state’s breeding bird atlas information was mistakenly (I can only assume of course) placed online for all to see. It was a falconer that took this delicate information to the appropriate person within the Pa game commission to make sure it did not end up in the wrong hands. The falconer who found the information was not afraid that it would be misused by falconers (on average 1.5 goshawks are taken by falconers in the state yearly), but that the nesting sights would be overrun by birders. PA falconers cooperate with all goshawk studies in the state and last year the Pennsylvania Falconry and Hawk Trust donated $1000 to the states goshawk research effort. As I said, I can’t speak for all falconers, but a majority of them have a vested in interest in the birds they want to hunt with and want them to have a healthy population in the wild. 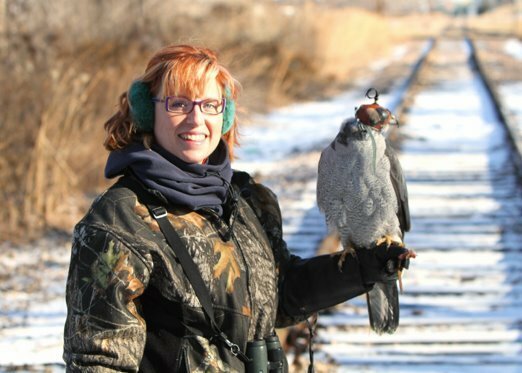 Falconers in MN paid for the first released peregrines in Minnesota and many donated their birds to the captive breeding programs. They don’t want to deplete a resource they love. An owl rehab center in Ontario found that Snowy Owls, Boreal Owls, Great Grays and Hawk Owls are very susceptible to West Nile Virus. How susceptible? 100% mortality among birds kept anywhere where they could get mosquitoed and where WNV is present. So to falconers who are proud owners of a Snowy, unless you have a mosquito-proof cage and if WNV is in your area, you may not have your owl for very long. I am glad to see that the world of birding and falconry cross paths more and more these days. Being a falconer and birder in the state of Michigan I get to hear it from both sides. All the negative press that falconers get is mostly due to misinformation or a lack of on the sport. I think it is great when organizations such as the Michigan Audubon Society ask the falconry community to come to events because I think the majority of people that have the biggest problem with falconry are birders. I can understand that because being a birder I try to push hard for conservation and the lack of interference that we play in their lives. Many see the falconry bird as a prisoner trapped in some “jail cell” and you know what, you’re right… We do keep them locked up (in my case a 15 ft. x 15 ft. room with 12 foot ceilings, 2 screened windows, 3 perches, and an air conditioner), but the truth is these birds have literally one driving force, FOOD. There’s a reason the bird flies freely through the trees for hours while hunting and they don’t take off. It’s not fear, companionship or starvation it is simply the ease of obtaining food, not to mention that it’s a fat vitamin rich quail instead of a vitamin deficient diseased mouse. You’ll hear about how falconry teaches the birds to hunt and survive but that’s not really true, the birds we capture have already been kicked out of the nest and have learned how to hunt on their own. The real deal is that we are keeping juveniles from dying off their first winter. It’s well known that juveniles of all species are weak and very susceptible to decease and adults have a greater chance for survival, that’s the way of nature. Another huge misconception is that we take the weak birds that were probably going to die and keep them alive; this is actually the opposite of what we do. Taking a weak bird and helping it survive goes against Mother Nature’s will and it would hurt the breeding population if we did so. For the 100 or so falconers in Michigan, most of us have a Red-tailed Hawk, some with Cooper’s and Sharp-shinned and an even smaller of us have Goshawks, Owls, or hybrids. Most release their birds after a year or two and repeat the process. Being properly regulated by the DNR is really the key, we work hand in hand to make sure these birds only benefit from the process and never hurt. If anyone ever has a question or concern you can feel free to write me an email (northm24@gmail.com) and I’ll try my best to help. There are very few falconers that have any experience with training or hunting with any owls. So unfortunately there exists much disinformation. That same incorrect information is what most pass along to others, as it is all they’ve usually ever heard, and they themselves have no actual experience. The Great Horned Owl is one of the species of owl in the US that can be trained for falconry. They have their own specializations and so flying them successfully is not for everyone. The GHO is neither slow or stupid, and they are a very successful species in the wild. Handled correctly, and flown at night, the trained GHO can catch prey species such as quail, rabbit, and even duck.